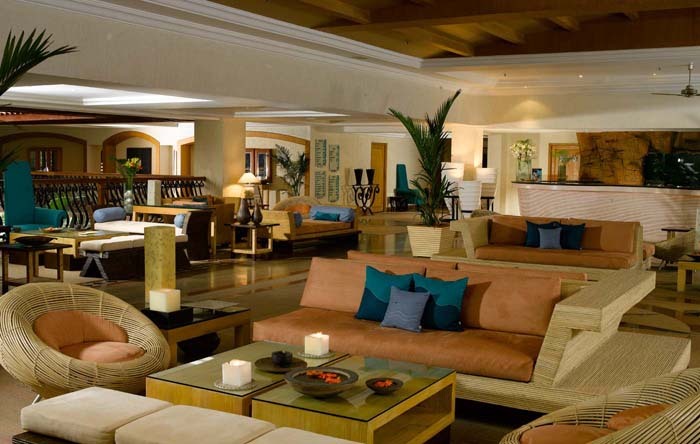 Oasis of Tropical charm and grandeur. 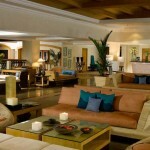 Zuri White Sands resort is an oasis of tropical charm and grandeur. With the jaw-dropping views of the pristine white sand beach at Varca this luxury 5 star resort with 154 nicely appointed rooms is a dream wedding destination for the discerning few! 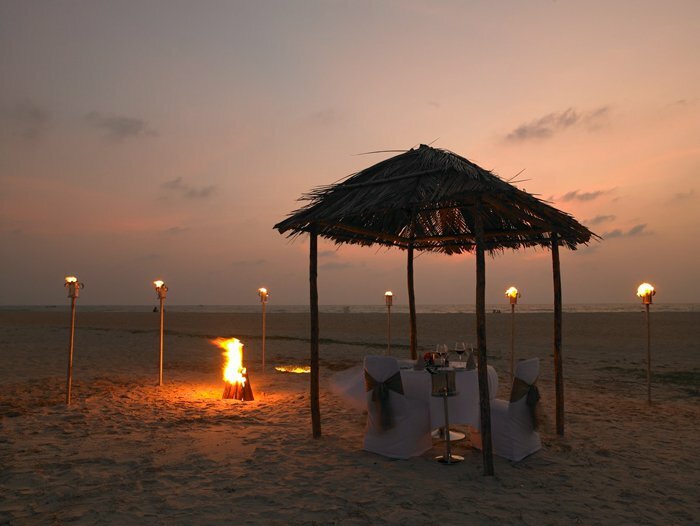 Goa has no shortage of picturesque -destination wedding worthy resorts, but Zuri White Sands at Varca is one of the city’s crown jewels. If a stylish beach front wedding is your dream, this stunning Portuguese-style resort is just for you. If you wish to stay away from the hustle bustle of North Goa, and soak up the sun with family and friends in a private setting then this is an ideal choice for your wedding party! From jaw-dropping views of the pristine white sand beach at Varca to Goan-luxe sensibilities, this luxury 5 star resort with 154 nicely appointed rooms is a dream wedding destination for the discerning few! 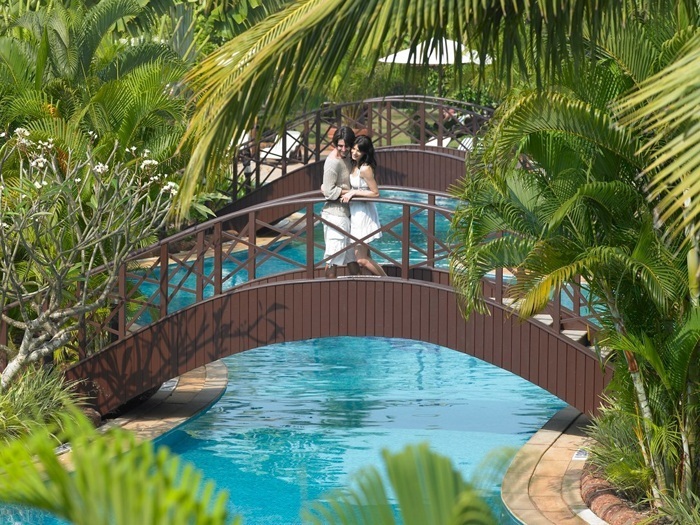 With beautifully landscaped gardens and lush lawns that are flanked by banana trees and coconut palms at every corner, to the rustic and romantic Portuguese inspired architecture noticeable in the colours and details of the building, Zuri White Sands resort is an oasis of tropical charm and grandeur. The resort houses exquisite suites built around gorgeous central courtyards, which come complete with a garden, patio and pergolas. The resort is the sole 5 star property on the Varca stretch and boasts of a huge meandering pool that runs across the entire property giving it a lagoon like appearance. Pretty bridges made to walk across the pool, stone sculptures and cobbled pathways enhance the charm of this well maintained property. The hotel takes upon itself to coordinate what it promises to be the most spectacular wedding event, catering solely to the choices of the bride and groom. Theme, décor, entertainment—everything is coordinated by Zuri. For those who wish to opt for a romantic church wedding, the hotel can even organize that in one of the surrounding churches, to add that traditional touch to the grand day. Hall will be given out from 9 am to 6 pm or 2 pm to 1 am. Every extra hour will incur an additional charge. Sake : Pan Asian restaurant & lounge offering the Live Teppanyaki. 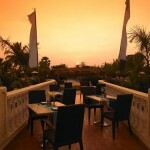 Tangerine : A bar and terrace lounge. The exotic cocktails with live entertainment. Waterfalls Cafe : The 24 hour multi cuisine restaurant. 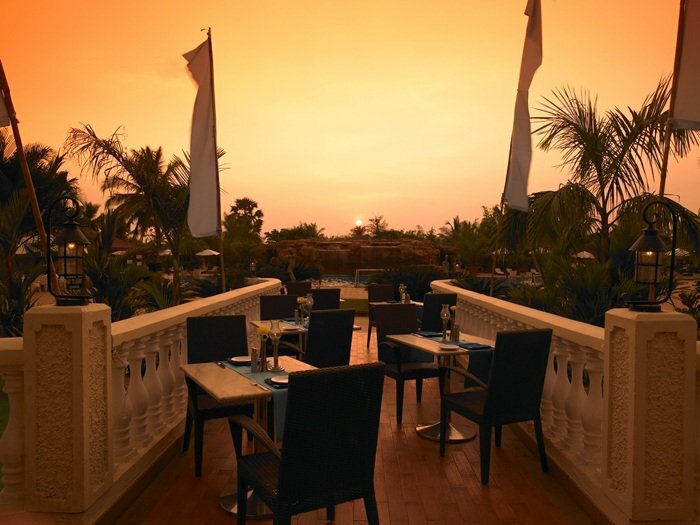 Fins & Rambooze : Enjoy the Delectable Goan cuisine at the seasonal beach restaurant and bar (operational from November to April). Blue Lagoon : The exotic variety of cocktails, pizzas and pastas at the swim–up bar. Zuri has many swoon-worthy wedding venues. 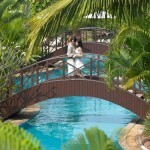 Couples can choose from 4 indoor banquet halls, an expansive beach lawn and a medium sized garden lawn. OYESTER 1 is a 2000 square feet banquet that is complete with an adjoining pre-function area as well as a private lawn called OYESTER LAWN. 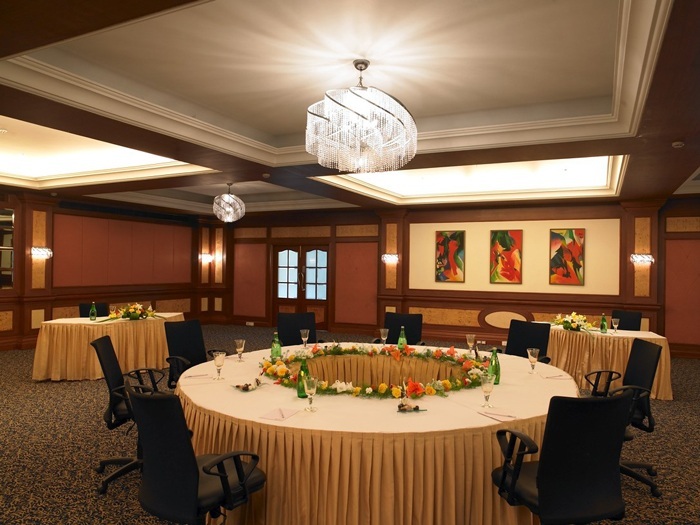 The banquet is adorned with chandeliers, coffered ceilings and an ornate carpet for a lavish feel. 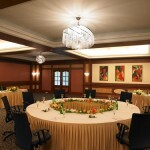 This venue can take a maximum of 180 people in theatrical style and 75 if you opt for a formal sit down (cluster style). UNICORN BALLROOM is a resplendent banquet that can accommodate 400 people in theatrical style and 150 in cluster style. The hall is 4000 square feet and has an adjoining pre function area and UNICORN LAWN. This traditional Ballroom screams sophistication with its wooden panelled walls, elaborate carpet, chandelier lit ceiling, LED lights, baroque charm and is sure to do justice to all your wedding fantasies! 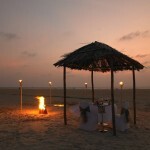 The SEASIDE LAWN is big enough to accommodate 1000 people in a luxury ceremony overlooking the virgin white sand bay. Another good option is the MEADOW LAWN which is perfect if you are expecting 400-500 guests.